On Tuesday, New York abortionist Robert Rho was sentenced to serve 1 1/3 years to 4 years for a botched second-trimester abortion. The abortion resulted in the death of Jamie Lee Morales, 30, and her child, who was at an estimated 24-26 weeks gestation. Rho could have been sentenced to 15 years had he been convicted by the jury, which was close to announcing a verdict. Because he pleaded guilty, however, Rho will receive a sentence which is much lighter. Rho’s defense attorney, Jeffrey Lichtman, who referred to Rho’s trial as a “modern-day lynching,” acknowledged that the sentence was a short one, telling The New York Daily News that Rho may even be released from prison in less than a year. Statements from District Attorney Richard A. Brown claim that Rho “has accepted responsibility and admitted his failure to provide adequate care following surgery.” Rho’s admitting to the negligence which lead to Morales’ death was a term for his taking a plea deal in order to get a shorter sentence. As Live Action News reported previously about the case, Rho was at first hesitant to even acknowledge his negligence, and had to be prodded into doing so by his attorney. 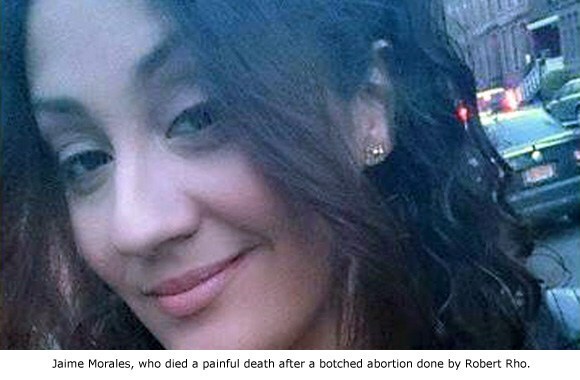 Morales died after Rho committed two abortion procedures on her. In the first one he nicked her cervix, which damaged an artery. Morales then collapsed, likely from blood loss. Rho performed a second procedure on her, though he failed to check her vitals, and did so without anesthesia. Rho reportedly cinched her cervix closed, which caused blood to pool in her abdominal cavity, though on the outside, it gave the illusion of halting her blood loss. Despite her condition, Morales was released and collapsed when her sister brought her to the hospital, where she died. During the trial it was revealed that the two abortion procedures and what followed would have been excruciatingly painful. Morales’ child also would have been at the gestation to feel pain from a dismemberment D&E abortion procedure, if the child was not killed via cardiac arrest due to the administration of a feticide such as digoxin first. The procedure was also meant to be done over multiple days, but Rho chose instead to commit it in only one day, putting Morales at greater risk, as Operation Rescue reported. Rho was known for cutting corners and using unqualified staff, as was also revealed during the trial. Such results proved to be catastrophic for Jamie Lee Morales. Women are not empowered when abortionists are allowed to continue harming them without fear of reprisal.